I discovered yoga at age 20 when I was living in Colorado. I immediately realized that my practice enabled my busy mind to slow down while giving my body the strength and flexibility to do all that I demanded of it. After having my son in 2008, I realized I needed yoga more than ever. I immersed myself in a 200-hour teacher training program through Finding Inner Peace Yoga School. I lean on yoga for my spirituality and to create that peace inside while living in such a stimulating world. I enjoy sharing my knowledge and love of yoga with my students. I focus on alignment and helping students understand their own body. My outgoing and approachable personality often shines through in my classes. Since 2012 summers have found me on my stand up paddle board (SUP) practicing yoga. This has become one of my favorite past times, and I look forward to teaching SUP yoga again this summer. My practice has been ignited by many teachers including Ana Forrest. I continue to take advanced trainings and workshops as much as possible and I’m currently working on a 500 hour certification. The style I teach is a mixture of vinyasa flow, a little heat, some Forrest influences (longer holds, concentration on core and high focus on prana (breathe)), a lot of anatomy and alignment cues and information. I teach a few very different classes each week. Ask me what's best for you! On the Mat with Melissa LLC 75 County Road, North Falmouth; yogagirlcapecod.com and theyogacollab.com; 774-994-1682. ​Gunjan started studying yoga with BKS Iyengar in 1964. She studied with him and TKV Desikachar in Switzerland and with Noelle Perez in France for 5 years. Most of her lessons were private or in very small groups so Gunjan learned to adapt yoga to the individual and still prefers to teach private lessons or small classes so that she can give each student individual attention. She has since studied with other teachers and incorporates knowledge from them into her teaching. Recently she worked with Amy Weintraub to learn what addresses anxiety and depression. The style of yoga that Gunjan teaches is called Viniyoga. This style uses breath initiated back and forth movements to loosen the joints and holding postures while breathing deeply to stretch and strengthen muscles. It also focuses on adapting the postures to be appropriate for each student. For a class schedule or to set up a private lesson with Gunjan please visit www.gunjanlaborde.com or call her at 508-444-6645. ​Jennifer Kelly, School of Inner Light-- For over 20 years, Jennifer has been an avid practitioner of wellness, yoga, and the art of living in peace. A native of Falmouth, and Certified Yoga Teacher, Jennifer has taught and lived throughout the U.S. and enjoys sharing a joyful and engaging presence with her students. She currently teaches classes with the Falmouth Community School and coaches private clients with transformational therapy sessions and integrated health and wellness sessions. Jennifer’s Winter Session 2016 class, Art of Yoga for Inner Peace, begins the week of January 25th for seven weeks. This soothing, supportive class cultivates deep relaxation and renewal, incorporating gentle yoga postures, energy movements, and core-strengthening exercises, as well as specific breathing and meditation techniques. For complete class description and registration information please visit www.falmouthcommunityschool.org. For questions or to schedule a private session, Jennifer may be reached at schoolofinnerlight@gmail.com or 508-981-4880. Laughter Yoga Leader & Laughter Yoga Teacher Together offering Free Weekly Laughter sessions since 2008. Laughter Yoga is a fun and easy way to breathe deeply and laugh heartily through playful exercises. Integrating therapeutic laughter exercises and yogic breathing techniques, Laughter Yoga can be done by almost anyone. There are documented benefits to physical and emotional health when deep belly laughing is practiced regularly. Laughter Yoga is based on a scientific fact that the body cannot differentiate between fake and real laughter if done with willingness. It enables everyone to laugh, even those who are serious, introverted and uncomfortable laughing in public. The exercises — which might initially seem silly or forced — quickly become a natural way of life. The goals of Laughter Yoga are improved health, enhanced joy, and a greater sense of community. Come laugh with us! 800-990-8290; info@capecodlaughteryoga.com; www.capecodlaughteryoga.com. ​Margot has taught in Falmouth for fifteen years. Svaroopa® Yoga is supportive and compassionate and provides benefits on all levels. Classes are held at The Yoga Way, Homeport, Building 350, Gifford Street, Falmouth. 508-540-3208; mbgarritt@yahoo.com; www.the-yoga-way.yoga. Please contact Margot before starting class, to check on schedule changes. A Vinyasa Style yoga class combining movement and breath with a strong emphasis on alignment. This class will challenge each student to safely stretch and strengthen the body while bringing a sense of calm and well-being to the mind. Poses are held slightly longer to create a strong connection with the breath. Modifications and hands on adjustments are given as needed. Moderate level of intensity and moderate heat 80f. Contact her at: 774-487-1228; ecody05@hotmail.com. Elaine is a physical therapist and yoga teacher whose classes have been described as fun and nurturing. Elaine is passionate about the healing benefits of a consistent yoga practice. She believes that yoga is a tool to keep one grounded and focused on those things that are most important in life. Elaine completed her 200 hour teacher training at the Sanctuary Yoga Studio in Plymouth. She also holds a doctoral degree in Physical Therapy. Bikram Yoga Falmouth is a dedicated BIKRAM YOGA studio in Falmouth, MA which opened its doors in 2012. Our mission is to bring improved health and well-being to everyone by providing high quality of instruction in a comfortable, convenient, and attractive studio. 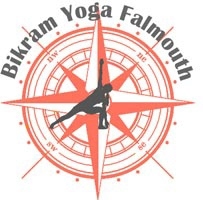 Bikram Yoga Falmouth is a clean, spacious, and well-ventilated studio. Bikram Yoga is an optimal physical way to reshape and strengthen your entire body, cleanse your internal systems, and create vibrant good health. In addition to the physical benefits you gain energy, poise, patience, and a sense everyday calmness. Bikram Yoga will become part of your daily routine, and an indispensable lifetime practice. 180 Teaticket Highway/Rt.28 (Driftwood Plaza) East Falmouth, MA 02536; info@bikramyogafalmouth.com, www.bikramyogafalmouth.com, 508-540-0089.